Lockport Little League and the Lockport Storm Travel program is proud to announce the official naming of their 15u and 14u Baseball Tournaments to be named as the Jeffrey A. Incardona Memorial Tournament Series. Both the Incardona Family and Niagara County Sheriffs Department have granted permission to dedicate this tournament in Deputy Incardona's honor. Deputy Incardona tragically lost his life on July 22, 1993 while responding to a fellow Law Enforcement Officers distress call. 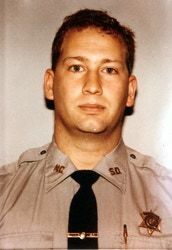 For more information on Deputy Incardona and other NCSD members who made the ultimate sacrifice please visit the​ NCSD website at http://www.niagarasheriff.com/in-the-line-of-duty.